Nuta and Téofila Szister (née Grynbaum) were both Polish immigrants who met in Paris. They were married in 1938, and their daughter Jacqueline was born the following year. When war broke out, Nuta volunteered for the French army, but during a call-up to the local police station on May 14, 1941, he was arrested and sent to Drancy (Beaune-la-Rolande). In June 1942 he was deported to Auschwitz, where he was murdered. Shortly after Nuta’s arrest, Téofila was denounced to the authorities by her landlord. Alone with a two-year-old baby, she decided to flee immediately to Lyon (Rhône) in the safer southern free zone, where a relative was already hiding. Fearing being discovered along the way, Téofila fed Jacqueline a lot of chocolate so she wouldn't cry. However the baby developed an allergy to all the chocolate, and when they arrived in Bron (Rhône), she was in urgent need of medical care. Téofila brought her to the local hospital, where she met Dr. Charles Faguin. Dr. Faguin immediately took the two Szisters under his charge. He gave Téofila false identity cards for the two of them, and invited her to take refuge in his apartment. After a while, he found them accomodation in a hotel right in front of a psychiatric hospital. He even arranged for Téofila to work as a maid in the hotel. Mother and daughter spent some eight months at the hotel, while Faguin constantly made sure they were safe. Jacqueline later recalled M. And Mme. Gentil, a couple who used to take her for walks in a nearby public garden. In fact, they were M. and Mme. 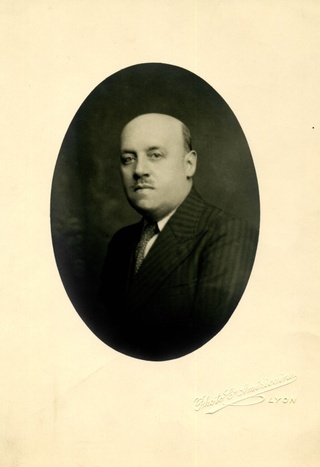 Didischeim, Jewish fugitives from Belgium, also beneficiaries of Dr. Faguin. When danger grew in the region, Faguin decided to transfer Téofila and Jacqueline to Pierre Combe, an acquaintance who lived with his family in the village of Vizille (Isère). Combe, a 72-year-old farmer, was a member of the resistance, and often gave shelter to young men who were working for the underground. Téofila and Jacqueline stayed with Combe until liberation. Sixty years after the war, Jacqueline returned to Vizille and found the farm where she had been hidden. There she met her rescuer's granddaughter, and the two women exchanged many emotional memories. On June 13, 2010, Yad Vashem recognized Charles Faguin and Pierre Combe as Righteous Among the Nations.